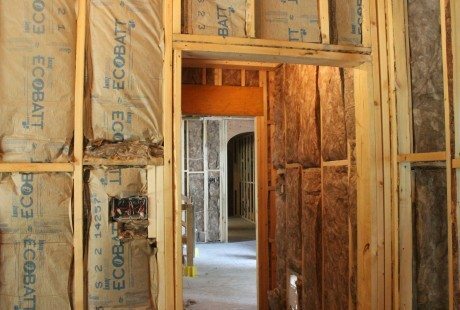 Each home and building is different – Foam Engineers will help you make an informed choice when it comes to choosing an insulation strategy. Often, we will suggest a hybrid solution – two or more different types of insulation. There are many different areas of a building, all serving different purposes. 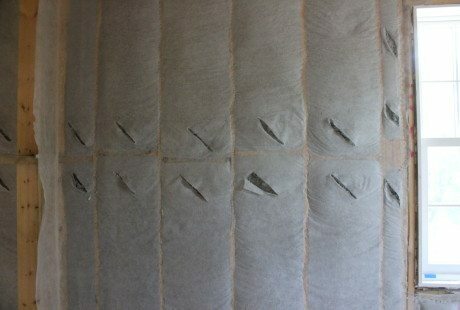 It makes sense to have insulation that fits the unique characteristics of each space. 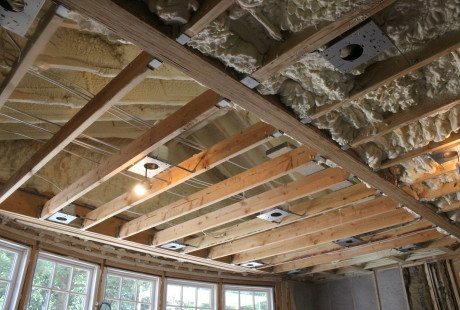 As insulation contractors, Foam Engineers specialize in a large array of insulation. 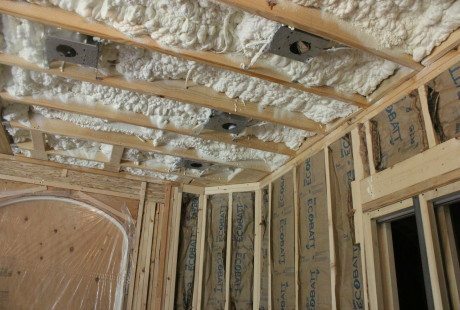 We offer many varieties of open cell spray foam, closed cell spray foam, cellulose, and fiberglass insulations. We also offer more options for commercial use like acoustic insulation and block fill. 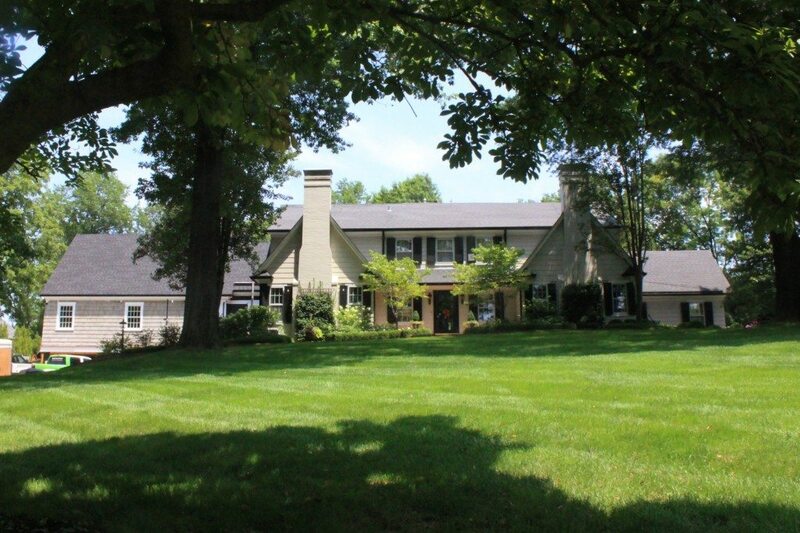 Foam Engineers was recently contracted to insulate an addition to a beautiful home in Ladue, Missouri. The original home appeared to be constructed around the 1940s. The addition is three stories, connecting to the original home on each of the floors. Foam Engineers, the contractor, and the homeowner all worked together to come up with a custom insulation plan for the addition. We created a hybrid plan consisting of open cell spray foam, closed cell spray foam, dense-pack cellulose, and batting. 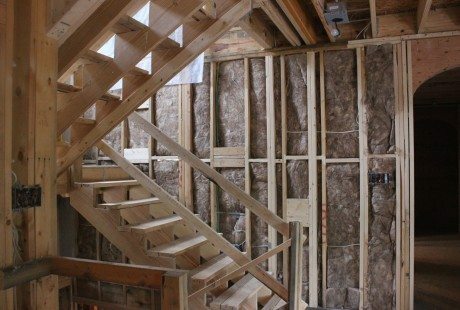 Foam Engineers sprayed R38 closed-cell foam to the roof sheathing and R21 closed-cell foam to the gable ends and attic walls where it adjoined the existing house. This put a nice, tight cap on top of the new addition. Foam Engineers applied closed cell spray foam to the roof sheathing. 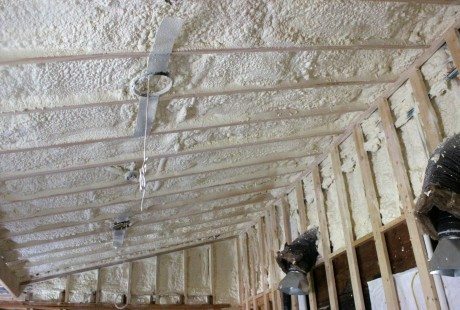 Spray foam boasts extremely high R-values. Closed cell foam, seen here with a coating of white intumescent paint, was applied to the gables and roof sheathing. In the office, we sprayed R18 open-cell foam to the ceiling and underside of the floor for sound attenuation. There was an exercise room below and a laundry room above. This ensured the office would be nice and quiet, even with other activities going on in the home. Open cell spray foam was also applied in the ceiling above the garage. Spray foam quickly expands upon application, filling all gaps and cracks. It can also be applied to a large variety of surfaces. 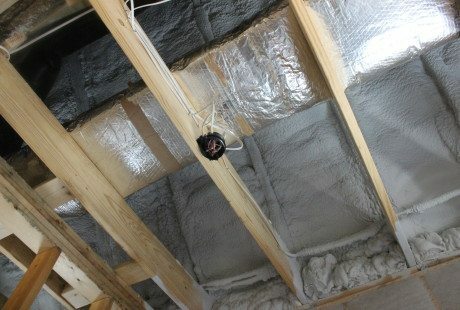 Open cell spray foam was applied to the ceiling of the office space. A laundry room is located above it. The foam will help minimize sound transfer. The exterior walls were insulated using R21 dense-pack cellulose, also known as a BIB system. Sheer netting is spread across the framing and stapled on. A small slit is cut in the netting and cellulose is packed into the cavity. With dense-pack cellulose there is no settling at the top of the cavity and it also provides uniform R-value. Dense-Pack cellulose was installed on the exterior walls of the home. Cellulose was compacted into the netted exterior frame of the addition. 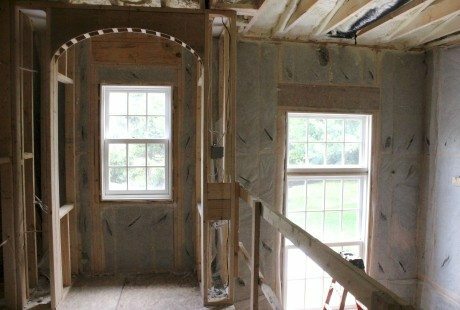 The homeowner wanted batts installed in all the interior walls in the addition. This helps with sound attenuation. Instead of using traditional fiberglass batts, the homeowner was interested in using eco batts. These are made from natural, sustainable materials instead of petroleum-based materials used in traditional fiberglass batts. Batts were installed into the interior walls to keep the house quiet and peaceful. Here the batts are shown in the second floor stairway. Brown Eco batting fills the cavities of the interior walls of this new addition in Ladue, Missouri.